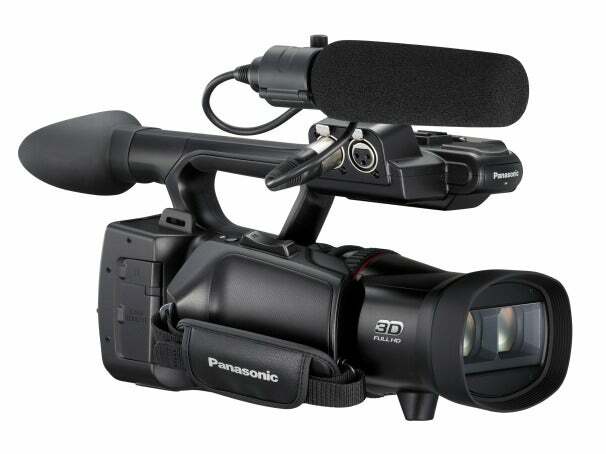 Panasonic today announced a high-end 3D camcorder that will be the first 3D camcorder to use the AVCHD Progressive video format (albeit in in 2D capture mode). The dual-lens, six-sensor Panasonic HDC-Z10000 will offer 1080p/60-fps recording, full manual focus and iris controls, high-end audio options, and manual controls to adjust the convergence point of the lenses during 3D capture. Also of note: The Z10000 has the largest model number--ten thousand--that we've seen yet on a camera or camcorder this year. From the looks of its video, audio, and three-dimensional skill set, it may earn that impressive five-figure distinction. The new Panasonic camcorder packs in a pair of the company's 3MOS sensors--each one a cluster of three 1/4.1-inch CMOS sensors that process red, blue, and green light separately--tucked behind two F1.5, 12X-optical-zoom lenses (32mm to 384mm). In 3D mode, optical zoom is limited to 10X. In 2D mode, the HDC-Z10000 offers slightly more powerful optical stabilization, although you can employ optical stabilization in both recording settings. 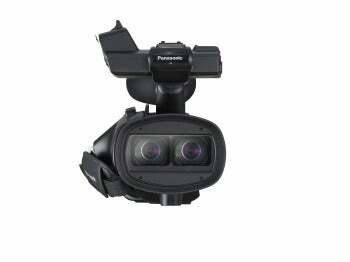 On the wide-angle end of that zoom range, Panasonic is touting the HDC-Z10000's 3D macro capabilities. The manual convergence controls must let the lenses get extremely cross-eyed, as the company says that the minimum focus 3D distance is around 18 inches from the lens. The HDC-Z10000 boasts a glasses-free parallax barrier LCD screen that can toggle between 2D and 3D display during recording and playback. 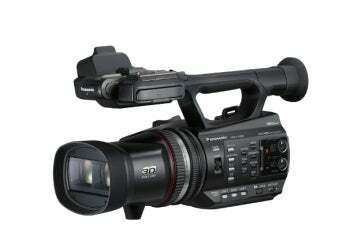 The 3.5-inch adjustable LCD has a 1.15-million-dot resolution, and the camcorder also sports a 2D eye-level viewfinder. Audio capture is geared toward the high end, as well, with two XLR inputs and 5.1-channel Dolby surround-sound mics on board. In 3D mode, the HDC-Z10000 captures left- and right-channel video simultaneously at 1080i (60 frames per second) and 1080p (24 fps and 30 fps) in MPEG-4 MVC/H.264 format. The camcorder also captures .MPO 3D still images at a 2.1-megapixel resolution. In 2D mode, the camcorder can record full HD 1080p video at 60 fps, as well as 1920-by-1080 video at 24p, 30p, and 60i in MPEG-4 AVC/H.264 format. Its 2D still images cap out at 3 megapixels in JPG format. For storage, it offers a dual SD/SDHC/SDXC card slot, which allows uninterrupted recording from one card to the next once the first card's maximum capacity has been reached. Panasonic has not finalized pricing or release-date information for the HDC-Z10000 at this point; but given its extensive manual controls, frame-rate options, and professional-level microphone inputs, it looks to be a higher-end rival to the Sony Handycam TD10. Panasonic also announced an as-yet-unnamed dual-lens compact camera featuring two optically stabilized, 4X-optical-zoom lenses. In addition to both 2D and 3D images, the new camera will capture 3D videos in high definition in AVCHD format. Little information is available on this new camera. However, since the company has made no mention of a glasses-free 3D LCD viewfinder, 3D image viewing seems to be limited to connecting the camera via HDMI to a compatible 3D TV, or inserting the camera's SD Card into a compatible 3D TV set. Panasonic has issued no pricing or release-date information on this new camera, either, but this product will be the first true twin-lens competitor to the Fujifilm FinePix Real 3D W3.